The PCA graphs are modified to illustrate the relation between populations and their movements. A detailed description of these ancestral populations and potential expansions with archaeological cultures associated with certain languages will be found in the books. Please report any errors by writing an email to cquiles@academiaprisca.org, attaching the necessary information for reference – unless it is a clear mistake -, and I will correct them as soon as possible. 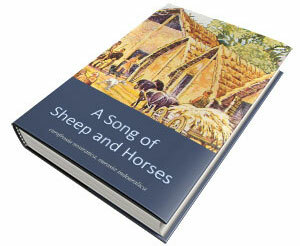 You can reuse and modify the images posted here as you see fit, but please cite the corresponding book and – especially if you use these high-quality images – this website (http://indo-european.eu/) as the source. Thank you. 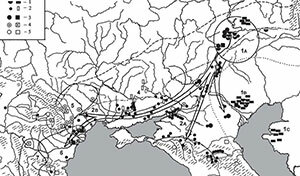 PCA of ancient and modern Eurasian samples (PDF). PCA of ancient and modern Eurasian samples, labelled (PDF). PCA of ancient and modern European samples (PDF). PCA of ancient and modern European samples, labelled (PDF). NOTE. 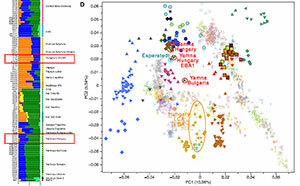 PC1 and PC2 have been inverted in European samples to fit the position of samples in the PCA of Eurasian individuals, which corresponds more naturally to the east–west and north–south distribution of populations. PCA of ancient and modern Eurasian samples. Mesolithic and Neolithic cultures referenced. PCA of ancient and modern Eurasian samples. Suvorovo-related admixture events in the Balkans drawn. PCA of ancient and modern Eurasian samples. 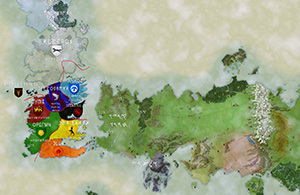 North Pontic admixture events drawn. PCA of ancient and modern Eurasian samples. 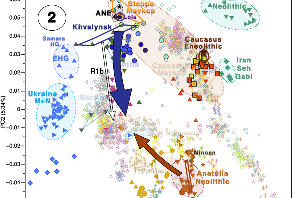 Late Repin admixture events drawn. PCA of ancient and modern Eurasian samples. Corded Ware admixture events drawn. PCA of ancient and modern Eurasian samples. 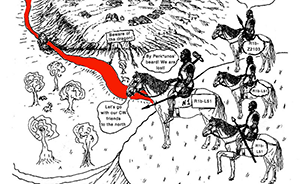 Yamna Hungary – Early East Bell Beaker admixture event drawn. Section of PCA of ancient and modern European samples. Yamna-related admixture events shown, including Bell Beakers, Balkan BA, Mycenaeans, and Armenia BA samples. Also marked are Assyrian and Old Hittite samples. Section of PCA of ancient and modern European samples. Czech BA, Únětice, Poland BA, Late Trzciniec, and Baltic BA samples (over semi-transparent East Bell Beakers). 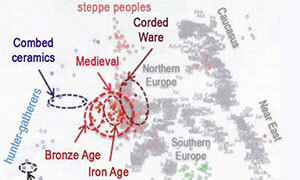 PCA of ancient and modern European samples, including Weltzin individuals of the Tollense battlefield. PCA of ancient and modern Eurasian samples. 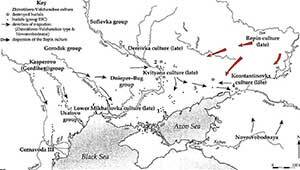 Poltavka-, Abashevo- and Sintashta–Potapovka-related samples have been labelled, including Andronovo and Andronovo East, Srubna, and Scythians and Sarmatians. 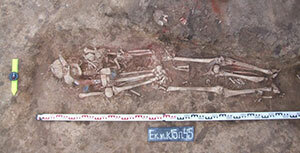 South Asian and Turan samples also marked. PCA of ancient and modern Eurasian samples. 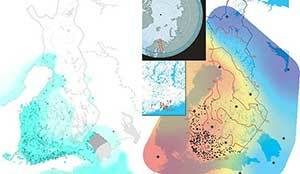 Bronze Age and Iron Age Fennoscandian populations and Saami admixture drawn. PCA of ancient and modern Eurasian samples. Ancient Palaeo-Laplandic, Palaeosiberian, and Altai clines drawn, with modern populations labelled. 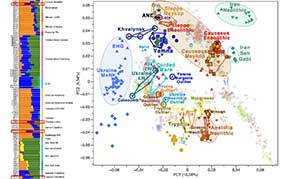 PCA of modern Uralic-speaking peoples with Palaeo-Laplandic and Palaeosiberian clines drawn. Image modified from Tambets, Yunusbayev, et al. (2018). Unsupervised ADMIXTURE results for K=6, corresponding to the ADMIXTURE results shown in stacked charts in supplementary maps.